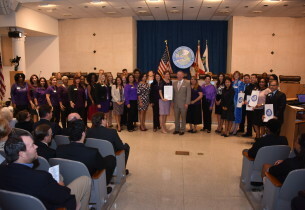 Orlando, Fla. (October 5, 2015) – Today, Harbor House of Central Florida and the City of Orlando announced the funding for the first advocate of a new, dedicated hotline for law enforcement to connect with while on-the-scene of an incident. The City of Orlando is the first to fund an advocate position through emergency shelter grants from HUD. A pilot program was conducted in Apopka more than one year ago and remains in place to this day. By having this immediate access with the Law Enforcement Hotline, the outcomes revealed that the service acceptance rate increased from 45 percent (when the survivor was contacted within 48 hours by a Harbor House Early Victim Engagement – or EVE – advocate housed at the Apopka Police Department), to 95 percent (when law enforcement called a specific number from the scene to immediately reach an advocate). Harbor House’s EVE program will remain intact as the Law Enforcement Hotline is designed to provide an immediate, 24/7 response. If the situation becomes a scenario where the EVE advocate is required to become involved, then the case will be transitioned when the EVE advocate is available. Currently, the EVE program is located at the Orlando Police Department, Orange County Sheriff’s Office, Orange County Booking and Receiving, and added last year to the Apopka Police Department. Harbor House’s shelter advocates will provide back up to the new hotline team but will be able to focus their time where it’s needed with the residents at the emergency shelter. They will back up the hotline team when there is a high call volume. “We anticipate the number of calls to double – up to 5,000 calls (give or take) per year,” stated Wick. Funding for the Law Enforcement Hotline advocate position began on October 1. Harbor House has also received funding for an additional four advocate positions through a grant from the State of Florida Office of the Attorney General from the Federal Victims of Crime Act. The Orange County Sheriff’s Office is currently working to utilize the Law Enforcement Hotline by the end of October. If you hear domestic abuse, please dial 9-1-1. If you or anyone you know might be experiencing domestic abuse, please call Harbor House on the 24-hours, confidential crisis hotline at 407-886-2856. Visit harborhousefl.com for more information about the organization and/or to learn how to get involved.